According to some source we came to know that the alarm clock of the iPhone is not working this morning, 1st January, 2011. As we know in November we face similar type of bug in the alarm clock of the iPhone. In that time iPhone had trouble with repeating alarms back during the change to Standard Time and single alarm failures. At the midnight, one off alarms will cease to sing out. According to a TiPB reader, You will be able to fix this bug by following the steps posted below. There are simply too many Iphone users in Singapore not to post this. STEP 1. First you have to tap clock. STEP 2. Then you have to tap Edit. STEP 3. Now you have to tap your alarm. STEP 4. Now you have to tap Repeat. STEP 5. Now you have to set a repeat interval. STEP 6. Now tap save. That’s it. 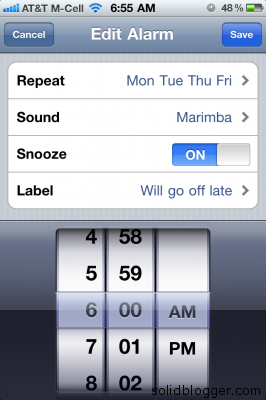 In this way you can fix the iPhone Alarm bug. According to 9to5mac, this alarm bug will fix itself on 3rd January 2011. According to Engadget, It is one time alarms that are causing the problem, not repeats. Don’t forget to share your views in the comment section below. As usual stay tuned with us for more updates. Wish you a very very Happy New Year.